Rebecca Gilbert works primarily in the mediums of woodcut, wood engraving, and intaglio to translate her drawings from the natural world into floating elemental reprieves - happy places that invite the viewer to slow down, live in the moment, and find optimism in that moment. Her work is characterized by a methodical technical approach to art making and a down-to-earth recognition of her own own primal cravings. Ms. Gilbert’s work is in numerous public collections, including: The Princeton University Graphic Arts Library, Zuckerman Museum of Art, and The Free Library of Philadelphia Print and Picture Collection. Her work is also in many private collections and has been exhibited extensively. A few exhibition highlights include: Commedia: New Prints 2015/Autumn, IPCNY, New York, New York; Editions Artists’ Book Fair 2014, New York, New York; Landing Place, Villa Huerto Ruano, Lorca, Spain; Cutting Edge: Contemporary Paper, Boise State, Idaho; Printivale!, Sharon Arts Center, Peterborough, New Hampshire; Treasure: Dirt and Stars, Marshall University, Huntington, West Virginia, and Shine, 110 Church Gallery, Philadelphia, Pennsylvania. 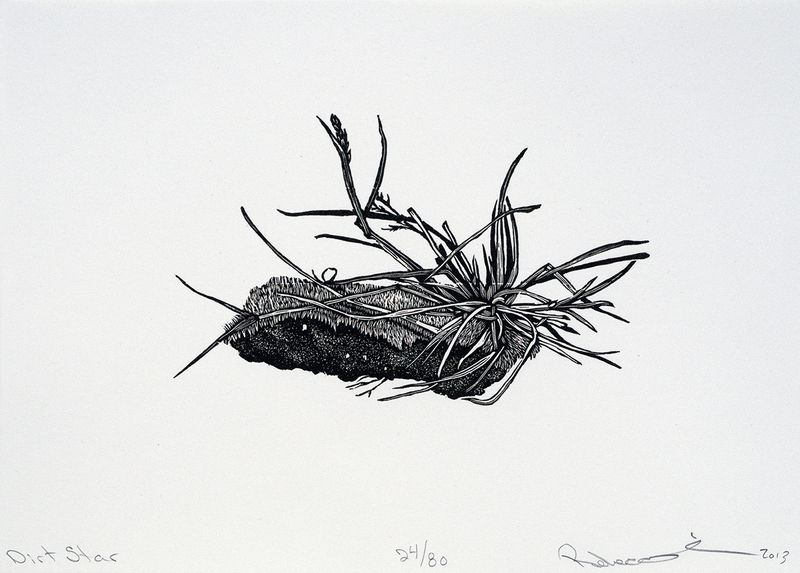 Among her most recent awards is an Artist-in-Residence at Sparkbox Studio on Picton, Ontario in 2016, a travel grant from The Center for Emerging Visual Artists in 2015 to attend OCHO Artist Residency in Questa, New Mexico, and a Surdna Foundation Enrichment Grant to support her exploration of wood engraving at the Augusta Heritage Center in 2013. Ms. Gilbert earned an MFA in Printmaking/Book Arts from The University of the Arts and a BFA in Printmaking from Marshall University. She also studied non-toxic etching at the Grafisk Eksperimentarium in Capileira, Spain. She currently lives and works in South Philadelphia and teaches at The University of the Arts, Maryland Institute College of Art, and Fleisher Art Memorial. A large selection of Rebecca Gilbert’s new works are currently on display at The Print Center, Philadelphia, PA where it is being featured in a solo exhibition titled Rebecca Gilbert: wonder. The exhibition is on view through April 22nd, 2017.